I went with Tammy to the Australian Sheep and Wool Show last Sunday in Bendigo. What a treat! We'd been saving for months to a spend up on some good stuff. Lots of pics. This is just the first lot. We didn't really visit the animal and farming area sticking to what interested us most...fibre and products. First shed we went in had a big felting area with lots of display from wierd to amazing. Should have taken a photo of the wall hanging you can see just a little of near Tam's head. This lovely lady showed me the basics of felting which sound interesting and pretty easy and had me deciding to defintely give it a go. 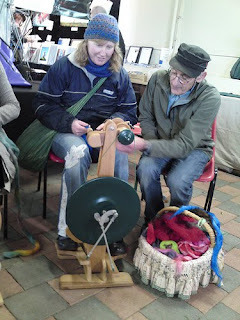 In another shed there was spinning and you could have a go. It looks so simple but there is definitely technique to it. Practise required. This year I decided to give it a go too. The man helping and an experienced spinner next to me were amazed at my first time work. They kept commenting on how well I was doing. I kept worrying the fibre was going to break and toward the end I was twisting it too much. Still, I felt pretty happy about my first handspun. And of course there was shopping to do! Tammy bought more of a variety than I did. Shopping for button above. I spent most of my money in the stall below--Garments and Gadgets. Great stuff, interesting and excellent quality. Lots of colour choices too. Here I stocked up on fibre for felting and some special wool mix stuff to help. Now I've got additional stuff to go along with the purple/grey fibre Matt and Kylie gave me for my birthday. I'll show you my purchases in another post. These necklaces were really interesting and different. I quite liked them. I actually quite liked the simplicity and interest of the grey one with a little multicoloured patch off centre. Might have a go at that one day. And below is a hat I also liked and want to have a go at creating one the same shape. This one was just intriguing. It's all felted. Some crochet competition work on display. A knitted hat and below Tam checks out the handspun entries. And this one!! This one is simply amazing! I love it. A seadragon with great detail and colour, handfelted. I think it won first place in it's category. Oh I am SOOOOOOO JEALOUS!!! Love the pictures and can only imagine how much fun you had! What a great day you both had! It looks like a fantastic festival. Glad you enjoyed yourself. I look forward to seeing what you make with your purchases! Hope you have time to play with your new stuff soon. When you've finished the sleeve! 1.5 days to go, isn't it???? I would have definitely bought one of those potato things!!! Looked incredible. I hand spun some cotton that we picked up off the side of the road @ christmas [we were in the car and it was very boring] its much like spinning wool. I like spinning because it feels like making something out of not much - you know? I found that felting small objects using bamboo sushi mats works really well - better than bubblewrap. It can wreck the sushi mat for sushi rolling though. Looks like a really fun day! !